In the second of his three essays on Mikhail Bakunin, political theorist Andrew Robinson addresses Bakunin's intellectual clash with Karl Marx, notably their different conceptions of freedom and revolution. There are so many Marxian themes and concepts in Bakunin’s work that, were he not Marx’s contemporary, he would no doubt be considered a neo-Marxist. Indeed, he often praises Marx’s economic analyses as groundbreaking. Why, then, did he disagree so sharply with Marx? In the essays collected in Marxism, Freedom and the State, Bakunin summarises his disagreement with Marx as a disagreement over means rather than ends. Bakunin seeks to destroy the state, whereas Marx seeks to capture and use it. Marx thus ends up on the side of authority, against liberty. Bakunin counterposes what he takes to be Marx’s aim to impose truth on the ‘ignorant masses’ with his own goal to propagate it horizontally, encouraging the excluded to act on their own initiative. 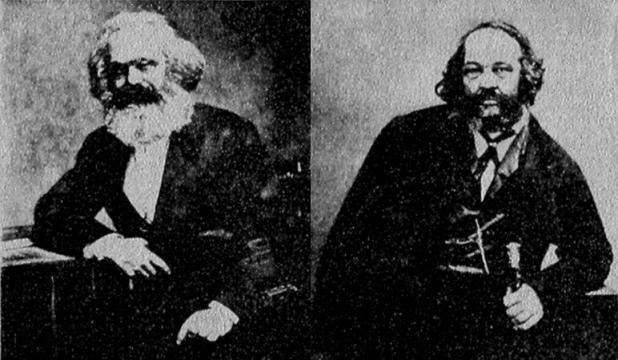 Bakunin believes that he and Marx are seeking the same outcome, but by different means: Marx believes, wrongly, that it can be achieved through top-down imposition. He accuses Marx of being a carrier of the Germanic ‘cult of the state’. For instance, Marx believes that historical instances of state centralisation, and even the defeat of peasant revolutions, are ultimately progressive, providing the foundations for revolution. He views Marx as following the pan-German position of dominance over Europe for a civilising mission. However, Marx is forced to be revolutionary as the existing political structure would have to be swept away for him to take power. Bakunin also accuses Marx of wanting to impose a very strong government in order to give people welfare and equality. For Bakunin, economic emancipation is impossible without destroying the state. Bakunin also takes communists to believe that the state should replace the capitalists as sole employer and proprietor, including seizing the land from the peasantry. He thinks that Marx is a big fan of the state, to the point of trying to institute a government inside the First International. He also claims that Marx’s project would lead to a kind of barracks regime, with armies of workers and farmers under the command of managers. Such a regime seems to offer justice and equality instead of liberty, but would fail to achieve these also. Also, any state except a universal state is incompatible with internationalism, since states rupture solidarity through war. And any state is incompatible with proletarian freedom because the state requires the subjection of the masses. He also accuses Marx of being an economic determinist, seeing all realities as coming from economic realities, to the exclusion of the role of states and nations in history. Bakunin believes that the state reacts back on the infrastructure, reproducing poverty. He thinks Marx uses economic determinism to avoid admitting the effects of state power. Bakunin is also a determinist and materialist, and believes that all events are ultimately ‘necessary’. However, he also believes they can be classified as good and bad. A historical event can have been ‘necessary’ in terms of its causality, yet utterly reactionary in its effects. Marx takes a teleological view of history, in which all achieved events are steps towards ultimate liberation. Bakunin takes this teleological conception to portray oppressors as liberators. Bakunin also takes exception to Marx’s view of the proletariat taking power. If the proletariat is to rule, there must be a new subordinate class beneath it. Marxism will lead to a new ruling class because it establishes the primacy of relatively elite groups within society. Bakunin advances at least three different versions of this argument. Firstly, he suggests that, if Marxism triumphs, the knowing intellectuals of the Party will take power on behalf of the people, becoming a new ruling class. ‘Scientific socialism’ is taken by Bakunin to mean a dictatorship by socialist scientists and professors. This would be the rule of the intellectual stratum discussed above. Bakunin sees Marxism installing real or supposed scientists as the ruling-class, ruling in the name of knowledge – a dictatorship by ‘heads full of brains’. State ‘engineers’ will form a new ruling political and scientific class, ruling the workers and peasants by command. They would try to direct the movement as if it were a machine, and thereby paralyse and pervert it. It would require, as Engels has admitted, armed force to keep the masses from messing up the progressive development of socialism, as seen by the elite. (This argument of Bakunin’s prefigures later theories of the ‘new class’ in Russia and Eastern Europe, such as the work of Milovan Djilas, Ralf Dahrendorf, and certain Trotskyites). Secondly, Marx privileges disciplined, organised workers, the ‘respectable’, ‘intelligent’, embourgeoised layer of workers, over the ‘rabble’, effectively establishing a dictatorship by those workers most privileged in capitalism (i.e. what would later be called the ‘labour aristocracy’). Bakunin deduces this from the idea of the proletariat as a ‘class’ rather than a ‘mass’ in Marx. According to Bakunin, such workers are turned into bourgeoisie by their ambition and vanity. And thirdly, it privileges workers over peasants, which means the forced subordination to a minority of workers of the overwhelming majority in countries such as Russia and Germany. Marxists are obliged to fear genuine popular revolutions, especially those of the peasantry. This is because genuine revolutions are ‘by nature anarchistic’ and destroy the state. Even if none of these events happens, Bakunin believes Marxism necessitates an elite. According to Bakunin, the state must always have a ruling class. This is because the state can only exist through the subordination of real wills to its own abstract will. This rule has to be embodied in a living force which carries out the sacrifice of others’ interests. Patriotism or state morality is always in fact the united interest of this privileged class. Today, we might think of phenomena such as growth coalitions as instances of this phenomenon. If a state continues to exist – even if its officials are former workers – the officials will come to look on others from a statist point of view. Even in an ideal situation – leaders elected directly from the people, not differentiated from it at all in their lives – Bakunin thinks an absence of classes would be untenable in a society with a state. The ‘habit of command’ will teach people to see themselves as superior. This argument is a logical extension of Bakunin’s view that people act on their class interests. On the other hand, according to Bakunin, it is absurd to think any group of individuals can become the guiding will of the revolutionary movement. Bakunin’s critique of Marxism is strangely prophetic in relation to the evolution of the Soviet Union. His critique of Marx was written a long time before liberals discovered the idea of Marxism as repressive, when they were still denouncing it as a force for chaos. It may therefore seem that he foresaw what was going to happen in Russia. The prophetic nature of Bakunin’s remarks may be exaggerated, for two reasons: the Bolsheviks took further the elements in Marx’s thought precisely those themes which Bakunin saw nascently (for instance, vanguardism and positivism), and Bolshevik authoritarianism seems to have emerged cumulatively, worsening due to the Civil War and subsequent factional conflicts. From a purely logical point of view, it is unclear that Marx is actually arguing for the position Bakunin attributes to him. He does not talk explicitly about an intellectual elite, the primacy of the upper stratum of workers, or the exclusion of the peasantry. Marx also provided an annotated critique of Bakunin’s remarks about his work, expressing astonishment at some of these claims. It is possible, however, that Bakunin deduced logical implications of Marxist discourse which were invisible to Marx himself. In particular, the effects of Marx’s statist aspirations, his teleological conception of history, and his authoritarian and Eurocentric account of the ‘civilisation’ of conformist strata provided seeds of later authoritarian readings. It should also be noted that the pattern of revolutions since Marx’s day have more closely followed Bakunin’s predictions than Marx’s. Revolutions occur mainly in poor countries with traditions of rebellion, often among the peasantry and/or the urban poor. Fanon’s discussions of the Algerian Revolution echo Bakunin’s discussions of the role of marginal people. Bakunin is in many regards a historicist, similar to Marx. He believes that history is driven by struggles between distinct classes and groups. What he takes to be a rational method is to deduce from the real fact to an encompassing ‘idea’, which is taken to explain it. In politics, this is taken to mean a movement to the most rational possible organisation of social life, based on the passionate demands of social life. This is similar to Marx’s method: the underlying reality is deduced from the surface appearance, and an essence posited which then provides the basis for a process of unfolding which realises it more completely. This leads to an account of history as becoming. Bakunin believes that life is a self-unfolding force, developing ‘out of its own inexhaustible depths’ through a succession of facts. Abstract reflections and ideas are simply milestones indicating points in the development of life itself. Bakunin believes in a ‘human’ ideal of full freedom and development of every individual, and spontaneous solidarity. The human ideal to which Bakunin aspires is taken to be already nascently present in the aspirations and instincts of the people. This is because it is inherent in humanity as a social animal. Freedom includes full autonomy in activities and development, without inspectors, directors or guardians. It is impossible to foresee the forms a future society will take. One can, however, deduce the negative conditions for its emergence from the critique of existing society. Institutions and historical events can be judged good or bad by their conformity with this ‘human point of view’. This is why an argument from the state standpoint is, in contrast, inhuman. Marx, in contrast, is taken to believe that a necessary event is also good and progressive. For Bakunin, certain historical events, such as the triumph of Rome over Greece and the Christian destruction of the classical heritage, are both inevitable facts and bad for human development. Bakunin thus rejects the teleological view of history. His theory has an independent dimension of ethical assessment separate from its observations of historical processes. Bakunin counterposes this to metaphysics, in which he includes Hegelianism, positivism, and ethical schemes seeking to force the future into a particular mould. He sees such theorists as elevating science or thought over life. Such beliefs are coextensive with the existence of the intellectual class discussed above. Bakunin believes that the idea that thought precedes life logically leads to the conclusion of supporting the state. The derivation of this view is unclear, but seems to stem from a division between thought and passion (or action): because these thinkers put thought before life, they must subordinate passion and action to thought, which in turn requires that they rationally direct social life. Bakunin, unlike Marx, sees the forces of affect and passion (or emotion) as an immanent part of the unfolding of life. Marx also had a view of life unfolding in history, but his view of life was rational, not passionate. Bakunin here prefigures the importance attached to desire and the body by recent theorists such as Deleuze and Foucault. Bakunin shares Marx’s reading of freedom as the full unfolding of latent human powers. This variety of freedom has no limits except immanent ones. The freedom of each person is not limited by others but finds its extension in them. Hence, it creates a world of human solidarity. Such solidarity arises as the extension of liberty (rather than an imposed obligation which negates liberty), because it stems from the social nature of humans, and the fact that no-one is free if others are unfree. It is to arise on the basis of social and economic life, as an effect of the free federation of different aspirations and interests. Freedom is counterposed, both to authority, and to the falsities promoted by the lovers of order. Bakunin’s presentation of it as virtually unlimited has, however, one limit: an obligation to work, drawn from the ‘very force of things’ or ‘facts’. This arises because Bakunin, like Marx, is seeking freedom for the essence of humanity, so continued conformity to the defined essence is required. Labour is taken to be the ‘foundation of human dignity and morality’, and of civilisation, separating humans from animals. People who are free obey the laws of their own nature (i.e. which accord with their essence) because they recognise them as such. People are also assumed to be fundamentally social. Society, like nature, is neither good nor evil, but a primordial fact, and it precedes the existence of individuals. Bakunin does not ultimately overcome Marx’s essentialism. Like Marx, he believed that all needs can be met through generalised labour, and everyone should be forced to work in order to bring this about. He is opposed to conditions of ‘being forced to work for other people’, but with an emphasis on the latter rather than the former. His objection to wage-labour is that some are supported in ‘idleness’ by the work of others. A revolution, on this model, is a moment which destroys hierarchical power. Bakunin seeks a revolution which abolishes all states and destroys bourgeois civilisation. For the state, revolution means death. There is for Bakunin an almost Manichean struggle between two contending principles: the campaign to strengthen the state at all costs, and the struggle for revolution from below. Hence, in a revolution, the cleavage between social forces is total. The revolution must, however, enact the means which it seeks to bring into being. No dictatorship can ever create freedom; every dictatorship necessarily perpetuates itself. Liberty can only be created through its very practice, ‘by an insurrection of all the people and the voluntary organisation of the workers from below upward’. People should organise through free associations, joined in a federation. Revolution is only genuine in the hands of the masses. It becomes reaction when it is concentrated in the hands of any governing group. This analysis suggests a view of prefiguration and immanence which puts Bakunin before his time. Paradoxically, this emphasis on total struggle and prefiguration leads Bakunin to argue for a more limited focus to campaigning. In the First International, Bakunin argues for a focus on economic struggle, which he thought would lead ultimately to a political struggle against bourgeois power of its own accord. He argued against the establishment of binding political principles. Once the revolution succeeds, Bakunin proposes a rough model of how an anarchist society would operate. Instead of states, Bakunin seeks a federation of autonomous, voluntary associations and communes. These entities will be ‘fraternal’, and seek to realise both freedom without limit of nationality, and equality among themselves. They would start from the level of productive associations of groups of workers, which would federate in districts, and the districts federate with each other. This is taken to express difference more effectively than a centralised state, though Bakunin also believes the lovalities will be integrated by a common aspiration and certain fundamental principles. Bakunin foresees this world involving the best aspects of his present, without the state regulations which limit them. For instance, railways would connect all of Europe without borders or inspectors. He also does not foresee the disappearance of world trade. His vision of a revolutionary society is largely limited to a united Europe, and his neglect of colonialism, in the light of his general hostility to conquest, is a glaring omission. Part Three is published on July 1st. Good general summary of Bakunin’s critiques of Marx. Bakunin basically agreed with Marx on economics and it is hard to argue with Marx’s genius in his analysis of capitalism. Bakunin, on the hand, is far away the more astute political analyst and had his pulse on the revolutionary ferment of the era. Marx’s brilliance as a philosopher and theorist gave him prestige in revolutionary circles which he fully exploited, but his theoretical conclusions also narrowed his ability to perceive events and see real world politics and blinded him to some of the valid critiques from Bakunin and others on his political methods. Bakunin’s anarchism, on the other hand, was more of an ethic rather than a philosophy that allowed him to clearly see the implications of Marx’s program and what a genuinely free and just society would look like and the path to achieve it. Unfortunately, while a path of revolution “from below upward” by the people themselves is in fact the only path to such a society, and authority and hierarchy do in fact (by Marxists and everyone else) preclude such a society, the chances of such a revolution succeeding are slim to none (due to the fact such a political project by definition threatens every established authority or potential authority including the “authoritarian” left). Instead, the Marxists preferred to take the reins and, with the Russian Revolution, actually did overcome capitalism, but in the process proved Bakunin all too right about their despotic tendencies. Marx and his followers, for all their certainty in their “scientific” analysis, were naïve about power and were more concerned about overcoming what Marx so convincingly portrayed as the central evil of our times – capitalism. The rest would take care of itself. When the time came, of course, the Marxists would throw every ideal and socialism itself out the window and perpetuate their own power. Bakunin and the anarchists saw deeper and were more concerned about the outlines of a free society and overcoming all authority. While they reached the right conclusions, their answers also indicated that a “free and just” society could never materialize. bakunin was right when he said that marx’s economic analysis had limited his vision of the innate freedom proper for a human being. the human being is seen merely as cog in a gigantic mechanism of labor to enhance materials production. Sams, I’m not sure why you say “the chances of such a revolution succeeding are slim to none”. There have been long periods of human history when statist societies have been absent, in the minority, or on the defensive. It seems to involve a certain strategic situation, however. There are tools, technologies and discourses which favour diffuse power, and tools, technologies and discourses which favour concentrated power. Today the concentrated power mechanisms have the upper hand. All it would take to turn the tide is for the diffuse power mechanisms to gain the upper hand. I’d speculate that diffuse power mechanisms may have gained the upper hand in some fields in the 1960s-70s, and only the recomposition of capitalism as neoliberalism (with new technologies and discourses) saved it at this point (e.g. states were losing guerrilla wars to popular forces across the board in this period). If diffuse power retained the upper hand then any authoritarian regime created on the backs of diffuse power would itself be vulnerable to a reactivation of diffuse power.